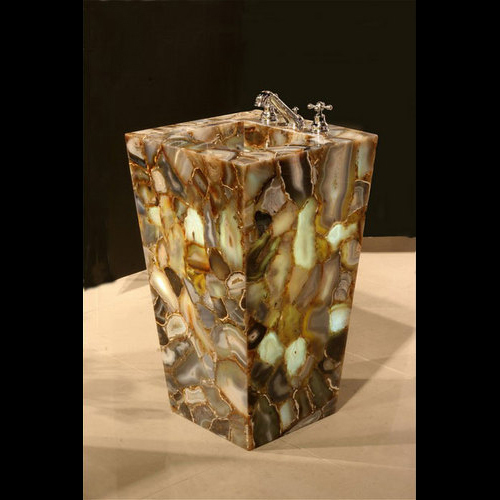 CUSTOM Solid semi precious gemstone pedestal sink of hand cut geodes in epoxy. The finish is a high polish. All projects are by the square foot plus shipping and any additional options, custom thickness, custom shapes, material combinations or profile edges. We give you the best materials manufactured by the finest artisans. Our materials are prefabricated to your specifications and delivered door to door. This material is also used for overlay kitchen countertops, vanity tops, tiles, inserts, shower walls, tub surrounds, ceilings, flooring, backsplashes, tabletops, baseboards, borders and listellos. Special Order. Delivery time of approximately six weeks, depending upon size and design. Please call our Customer Service Department for more information at 239-949-7024. PRICE SHOWN IS WITHOUT SHIPPING. The price given does not include the faucet.